Not only can you buy fresh coffee from our online shop, you can now get your fresh coffee fix from Sacrewell Farm’s shop. Sacrewell Farm is a fun filled experience for the whole family. Not only is it a visitor attraction but holds history that dates back to 1086! It is now run as a charity and has the support from an awesome team of employees and volunteers. The team all add to the experience and enjoyment whilst you are there. There is more than enough to do and see at Sacrewell to keep the whole family entertained. You’ve got the farm animals, a discovery centre for the smaller animals. You could have a goosey’s around the 18th-century watermill, play around on the historic farming equipment or take up a bit of wildlife spotting. You can even relax in the onsite café and take home lots of locally source goodies in their farm shop including Two Birds Spirits. If you want to make it more than a day trip, you can set up camp in either a tent or bring your glamping comforts. They even have electric points for all of your creature comforts. Be sure to check out their events calendar for outdoor cinema events and much more. Situated at Sacrewell, you will now find Two Chimps… In the farm shop not in the farm yard- ha! You can buy fresh coffee at Sacrewell farm, and there is a choice of 3, single origin speciality coffees. Have as much as you would like and the awesome team will even grind it for you while you wait. If required, the coffee can be ground fresh for your device. We deliver freshly roasted coffee to Sacrewell Farm every week to make sure that you will be buying the best and tastiest coffee. 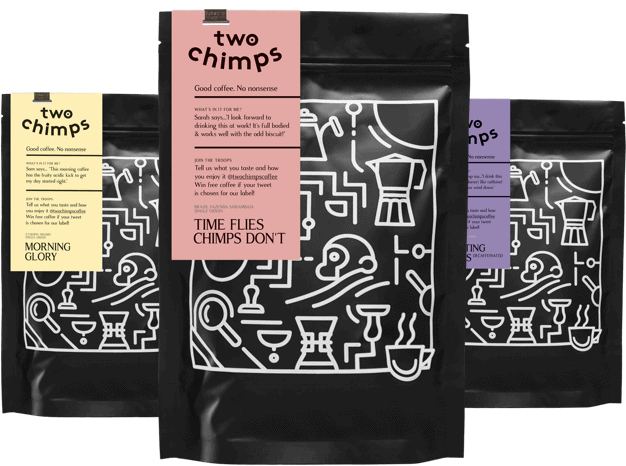 You can also find the super cool Two Chimps Coffee tins there along with a few other coffee related items. Oooh heaven! So, what are you waiting for? A family day out finished with buying a bag of Two Chimps Coffee to take home. Sounds like a plan batman. If you are wondering where else you will find the chimps- check out our Where can I try Two Chimps Coffee page to find out!